Walnut Creek, CA – The Pac-12 announced today that Sophomore Parker McGuiness was named Pac-12 Conference Player of the Week. McGuiness, in his first year as a Ute after transferring from North Carolina State, earned the accolade after going undefeated against rival BYU. In doubles, partnering with Jamey Swiggart at No. 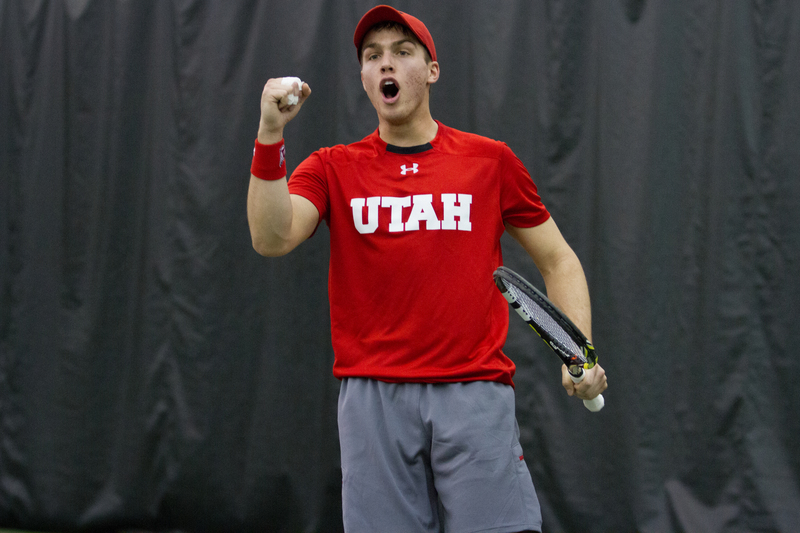 3 doubles, he clinched the doubles point for the Utes beating Shane Monroe and Jeremy Bourgeois, 7-6(2). In singles, McGuiness earned a straight set victory at No. 2 singles over Andrey Goryachkov, 7-5, 6-2, contributing to the 4-2 victory over the Cougars. He is now 11-4 on the season. McGuiness and the Utes are back in action Friday at 6pm at the Eccles Tennis Center when they face former Mountain West Conference foe New Mexico. This entry was posted in Awards, PAC-12 / NCAA News and tagged BYU, Pac-12, Parker McGuiness, player of the week, Roeland Brateanu. Bookmark the permalink.